All catfisherman are created equal, however the opportunity for all catfisherman to catch the monster cats in there region are not equal! And by that I mean, the populations of the different species will occur more prominently in different parts of the country, so where you live and also the body of water your fishing in will dictate the size catfish you can expect to catch. 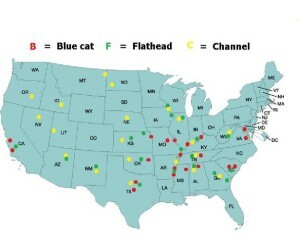 Some regions in the U.S. will support all three of the most sought after species, bluecats, flatheads and channel cats, and other parts of the country will only support two of the main spiecies, the flathead and channel cats while most all regions in general will support of course the good ole channel cat, which is the most abundant catfish available to anyone in the U.S.
Of the three species, the bluecat will grow the largest and the flathead coming in a close second and then of course the channel cat in third. Are the largest of the species, some topping out in excess of 120 lbs. and found mainly in large river systems and reservoirs, though they do inhabit small feeder rivers during the spawn. They mainly thrive in larger rivers with a relatively moderate to swift current flow. Like the Ohio river, Mississippi river, and tidal waters like the James river in Virginia and the Potomac river in Maryland plus they have been introduced and are also thriving in some larger lakes throughout the country. Blue catfish will stay active and feed throughout the year. Their preferred habitat in large rivers, is the deeper areas that have a moderate to strong current. Within these areas, blue catfish generally seek out deep holes with abundant cover that provide relief from strong currents, but they also like to roam the open water to feed, Look for outside bends in rivers, tailwaters below dams, creek mouths, humps and mussel beds are all common blue cat locations. In large reservoirs, they inhabit many of the same features as they do in rivers: deep, secluded areas with plenty of brush and other natural or man-made cover. The absence of current in many reservoirs causes blue catfish will roam the open water to cover more area when actively searching for food, which often brings them shallow during peak feeding periods. Therefore, they often seek areas that provide both the security of deep water and the easy access to shallow feeding areas. Blue catfish can be caught day or night, because of the shear size that they grow to plus there active feeding habits and opportunistic traits. The smaller blues will feed on the same things the channel catfish will, but if your wanting to land a 40 lb. plus trophy, your going to have to fish with larger baits such as 10-12 inch gizzard shad and whole or large chunks of skip jack herring. Depending in the region you live the flathead catfish can be called different names! Such yellow cat, shovelhead cat and mud cat. The fish can be found throughout the central and south central U.S., and thrives in viable habitat ranging from large rivers and reservoirs to small streams. The flathead is a very predatory fish, preferring live bait, Freshly caught live shad and bluegills, injured minnows, and nighcrawlers are among favored baits, but flatheads will also hit a fresh piece of cut bait as well. Keep in mind though the flathead are home bodies, they like to lay in cover in the day light and generally will only stray out away from home and actively feed at night, but they can also be caught in the daytime by targeting there lairs and offering a fresh bait to them in the front door of there comfort zone. Although a flathead might not actively pursue feeding in the daytime, they are just like all other species of catfish, they are opportunistic feeders, the flathead catfish will not pass up a live bait that’s placed in there face! Flathead catfish are one of the largest growing catfish in North America, with weights exceeding sixty pounds. 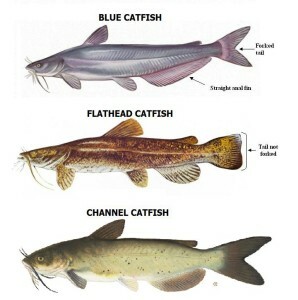 The most common catfish in the U.S. and is found in most regions through out the country. channel catfish are the most opportunistic catfish when it comes to feeding, by that I mean they will hit most anything smelly or dead! Such as man-made cheese or blood baits, chicken livers, shrimp, cutbait and even your favorite homemade concoctions! Keep in mind though that these baits mentioned above will catch channel cats of all sizes, your trophy channel catfish of 12-15 lbs. and larger will more than likely be caught on the more natural baits such as fresh cut shad, bluegill and other similar types of bait fish, like the creek chubs. As mentioned before, channel catfish are abundant through out the country, and there’s plenty of eaters to be caught most everywhere. but if your going to target the trophy channel catfish, you have got to fish where the big ones live! Now I’m not saying you can’t catch a 20 lb. sleeper channel out of gram pa’s farm pond, but your best chance for a trophy is to look more to the reservoirs and rivers in your region!